Raquel Chang-Rodríguez, Ph.D., New York University, Distinguished Professor of Spanish-American literature and civilization, has researched the New World chronicles of the early contact period, colonial poetry, the relationship of texts and images and indigenista trends. 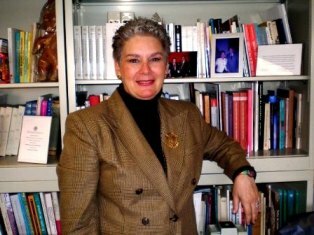 She is the author, editor and co-editor of fifteen books, the founding editor of the prize-winning journal Colonial Latin American Review, and the recipient of several awards and grants including a National Endowment for the Humanities (NEH) semester fellowship. Among her books are: Cartografía garcilasista (Alicante: Universidad de Alicante, 2013), Aquí, ninfas del sur, venid ligeras. Voces poéticas virreinales (2008), La palabra y la pluma en "Primer nueva corónica y buen gobierno" (2005), and the editions of Entre la espada y la pluma. El Inca Garcilaso de la Vega y sus "Comentarios reales" (2010) as well as a collection of essays appearing simultaneously in English and Spanish, Beyond Books and Borders: Garcilaso de la Vega and "La Florida del Iinca" ( / Franqueando fronteras: Garcilaso de la Vega y "La Florida del Inca" (2006). The National University of Athens (Greece) awarded Chang-Rodríguez a Doctorate Honoris Causa (2011); she is Profesora Honoraria of the Universidad Nacional Mayor de San Marcos (Lima, Peru), Miembro Correspondiente of the Academia Peruana de la Lengua, an affiliate of the Royal Academy of the Spanish Language, and teaches at the Ph.D. Program in Hispanic and Luso- Brazilian Literatures and Languages, The Graduate Center, CUNY. La apropiación del signo: tres cronistas indígenas del Perú (Tempe: Center for Latin American Studies, Arizona State University, 1988), etc.